St. Anselm, a Benedictine monk who lived during the 11th and 12th centuries in Europe, is a doctor of the Church and is remembered as a great philosopher and theologian. He was the originator of the onto-logical argument for the existence of God in his work Proslogion. 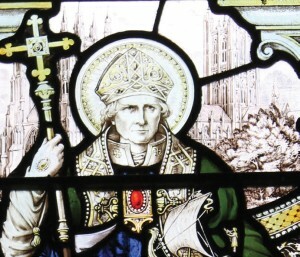 In it, St. Anselm wrote: “God is that, the greater than which cannot be conceived.” He is often mentioned as the brightest Catholic intellect be-tween St. Augustine in the fifth cen-tury and St. Thomas Aquinas in the thirteenth century.Anselm wished to enter the monastery at an early age, but his father did not approve. He eventually left his home in Italy in 1057 at age 23 and entered the Benedictine monastery at Bec in Normandy, France. Anselm’s repu-tation as a superior intellect, along with his honesty and devoutness, soon led him to be elected prior of the famous monastery at Bec. In 1093, Anselm was named archbishop of Canterbury. In that position, he upheld his monastic vows and pushed for reform. He was exiled twice because he refused to accept the concept of royal con-trol over both church and state. He died in 1109.